A project that we've been tracking longer than almost any other is the adaptation of J.G. Ballard's "High Rise". Vincenzo Natali (Splice) was originally attached, but his vision of an exclusive tower on an island in the ocean never launched. Then Ben Wheatley (Kill List, Sightseers) and Tom Hiddleston came on board and everything just seemed to click. The film just premiered at the Toronto International Film Festival and the reviews are rolling in. Reactions to the film are decidedly mixed from comparisons to Snowpiercer to some outlets calling the film a "mess". Here's what people are saying following the film's premier. "From a cinematic standpoint, "High Rise" has much in common with last year's "Snowpiercer," which imagined a post-apocalyptic future where humankind has been consigned to a moving train. While Bong Joon-ho tracked the battle of lower class residents battling to the front of the train, Wheatley finds his characters literally angling for upward mobility. 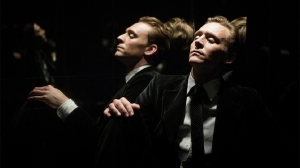 "High-Rise is a rich and fascinating mess. But it is a mess. Wheatley and Jump have turned the lean, lucid architecture of Ballard's prose into a baggy, disjointed, sprawling grand folly of a movie. The biggest disappointment is an almost total lack of menace and humor, key selling points in all their previous films. "Wheatley wades into the prescient 1975 text, delivering a complex, fluid interpretation which is respectful and almost-faithful while still being its own beautiful, crazed beast.